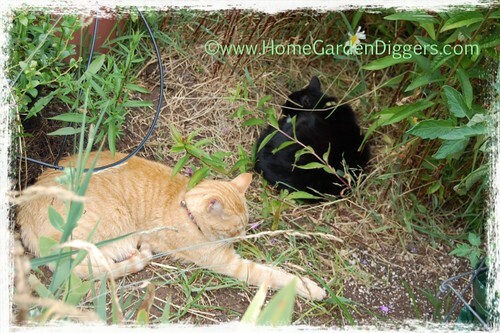 Summertime ‘An The Living Is Easy….at least that is what my cats Raja and Zoe think. Here they are sleeping away amid the phlox. Elsewhere in my garden one of the premier flowers of summer, daylilies are blooming, providing a bit of summer sizzle. I remember my grandmothers’ row of Orange Daylilies that got no water, other than rain, in the hot Missouri summers. So many colors now. I started with only the beautiful, Double Orange Daylilies that were at my house when I moved in. 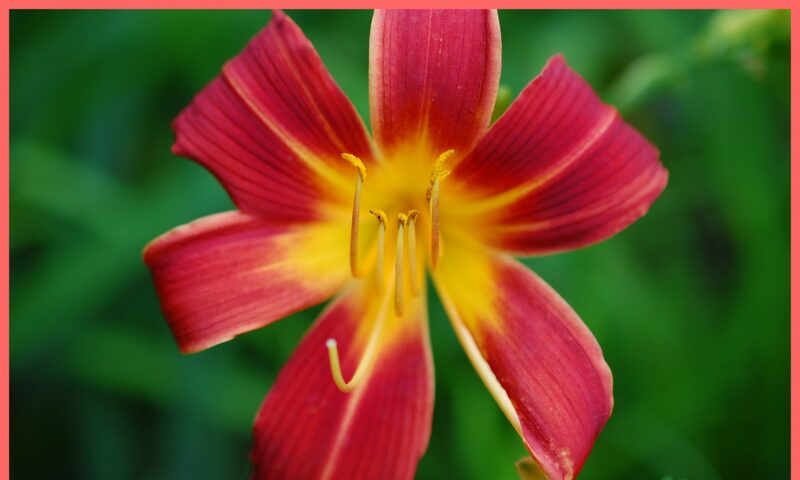 Now, I have many others in an array of colors I enjoy growing daylilies. 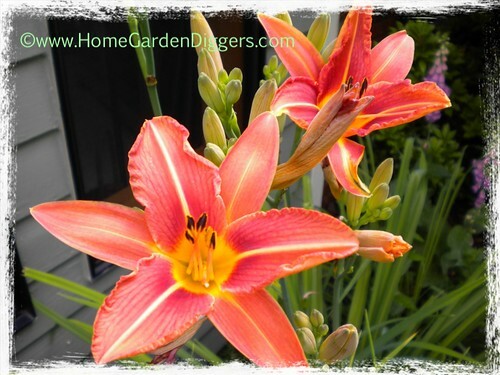 Daylilies come in a variety of sizes, from about a foot tall all the way up to four feet tall. They are fairly carefree and can tolerate dry conditions if need be, although they are only moderately xeric and bloom better when they have adequate water. And they definitely like a sunny spot with good drainage. 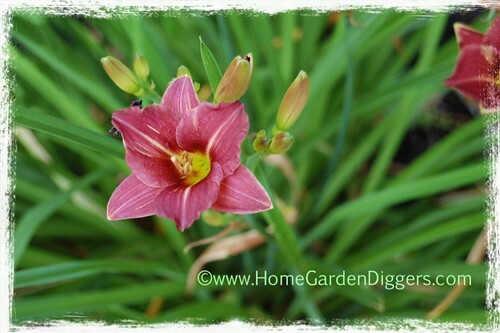 A little bit of dead heading, will keep your daylilies looking beautiful. Come into my garden and see the daylilies that I have blooming. Some of them are almost done now, but others are just starting. A few, like Stella D’Oro will bloom off and on all summer, while others have a finite bloom time. This Orange Double Daylily was here when we bought the house. We have no idea what it is. It is about three feet tall, and the clump now needs to be divided, it is so huge. The previous owner of our house told us that she had been unable to get anything to grow under the front window, because it is so hot. So, I figured that daylilies would likely be perfect. I was right. 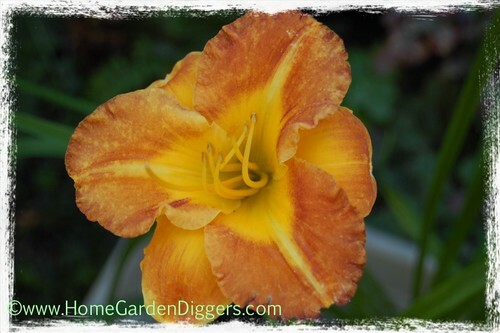 I have about six daylilies there, including this beautiful Orange Daylily with the darker orange throat. It is about 25 inches high, with flower stalks that go up to almost four feet. This brownish orange one is still in a pot, but I do have a spot for it It gets to about two feet. Here are some of my yellow daylilies. 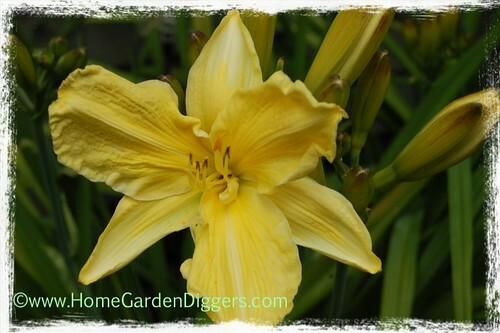 This Yellow Spider Daylily is one of my favorites. The flowers are huge, almost 7-8 inches across. It didn’t bloom the first year, but this year had a lot of blooms. Stella D’Oro is a real work horse. 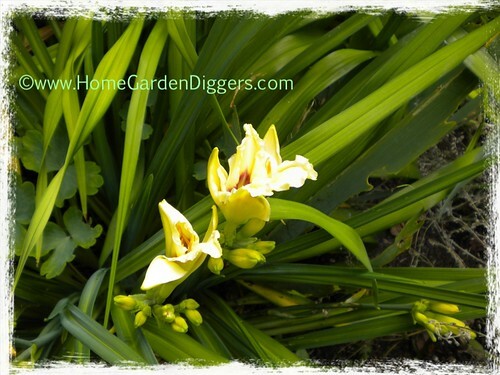 They bloom all summer long, are low growing (only a foot high), and are a great filler plant. I caught a bee visiting this one. This yellow beauty is also beneath my front window. The flowers on it are huge, although it is only about 24 inches high. 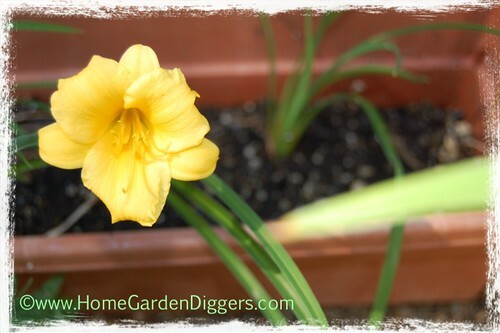 This is another Yellow Daylily that I haven’t planted yet. It is still in a pot, but is doing wel, and it is blooming. 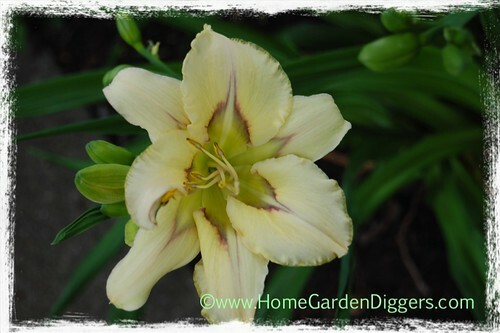 I also have several buff colored daylilies. This is Pandora’s Box Daylily. It is fairly short,but the dark maroon eye is a wonderful contrast that really stands out in the garden. 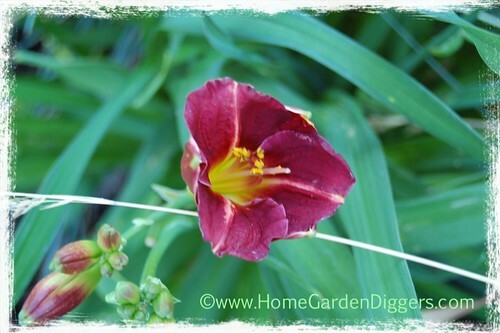 I have it planted near the sidewalk as part of a row of daylilies that go around a corner. I was afraid that this is too shady a spot, but it seems to bloom quite well. This Buff Colored Daylily is also under my front window and it has a purple and green throat. It is on the small side, as are the flowers. 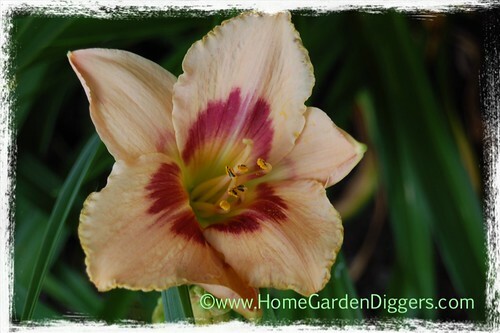 Another Buff Colored Daylily. This may be a duplicate of something else I showed you, but after the fact, it is a little hard to tell. 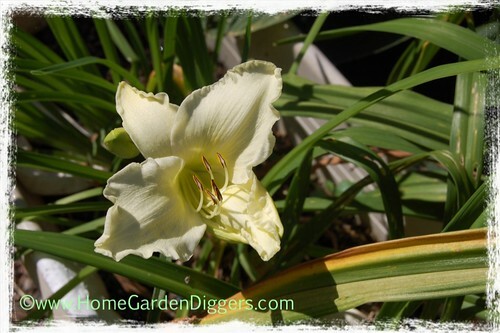 I had been looking for a White Daylily, and I found this one at the Seattle Home And Garden show last year. It is still in a pot, but is about ready to go into the ground. I couldn’t decide whether the Blue Eyed Butterfly is buff colored or white. All I know, is I love the blue and purple star shate at the throat of this beauty. 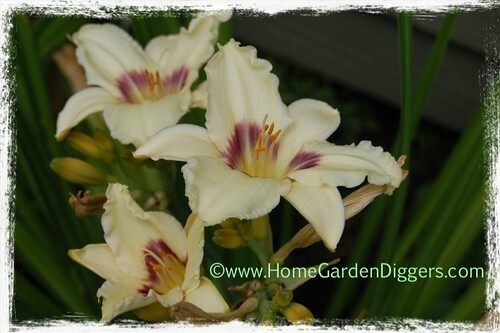 This is one of my very favorite daylilies. 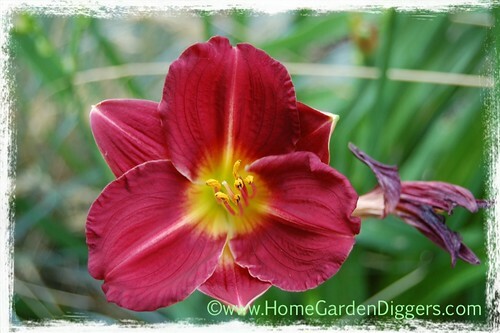 This Red Double Daylily is one of several reds that I have in my garden. This one is also under my front window, and I love being able to look out and see it. My Purple Daylily is a nice rich color and the flowers are fairly large with some frilly edges. Bright Red Daylily. This one has fairly small flowers. Another Reddish Purple Daylily. This one also has small flowers. It is interesting that at first, I thought the flowers were a little too small, but now that the plants are maturing a little more, the daylilies are full of many, many small flowers. The mass of flowers is lovely. Another Red Daylily. This one is russet colored, and is another of the small flowered ones. 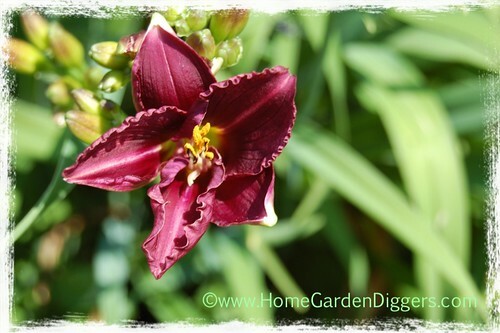 I can’t decide whether this daylily is light red or dark pink. It sure is lovely. 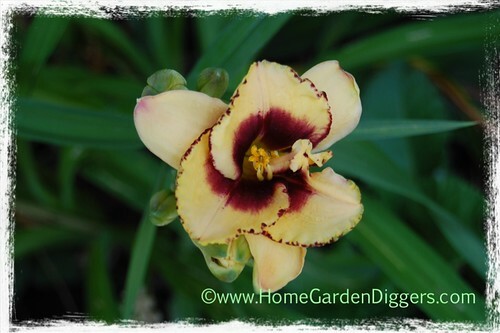 It is also one of my small flowered daylilies. There is no doubt about the color of this one. I love this Pink Daylily with the dark red throat. The flowers are fairly large. 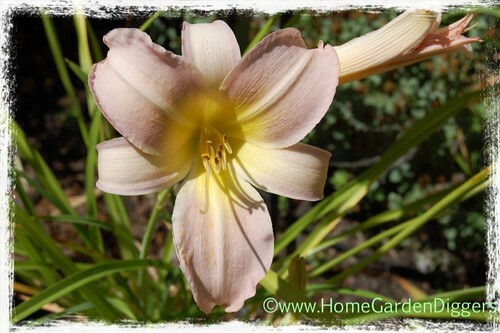 This beautiful Mauve Daylily is my latest acquisition and was an impulse buy at the nursery. I just couldn’t resist that color. It had no tag, so I have no idea what it is. I just know that I like it. That is about all I have from my ever expanding collection of daylilies. Hope you have enjoyed your stroll through my garden. I’m going to be visiting a number of Blog Parties. I hope to see you there. Sorry that your Daylilies are feeling the heat. So many of us are. They do well around here, but we are a little .cooler. I do know that there are many that hold up pretty well even in hot summers, although they may not bloom as well. Hope you manage to stay cooler. Thanks and thanks for coming by. I really do love how easy Daylilies are to care for, and they give so much back. Wow, you have a lot of beautiful flowers! Thanks and thanks for coming by. Hoping you manage to stay cool. So many beautiful day lilies! Thanks for stopping by. And thanks for your comment. The only problem with Daylilies (as with a number of plants), you can’t have just one. I just ordered another one. Fantastic collection! I’ve only come to appreciate the beauty and hardiness of Daylilies in the last three years. I’d never grown them before and now I just don’t know how I would do without them. How I wish I had loads more room for many many more. Thanks. Aside from their beauty, the one thing I really like about them is how easy they are to care for. Not much to do. Glad you are finding out about them too. beautiful blooms, i love daylilies!!! They are really something I like too. So easy. Thanks. I really like that double red too. Thanks for the possible name for the mauve one. I looked it up. It sure looks like Butterfly Kisses. You have such a lovely collection yourself. Your daylilies are really pretty! I enjoyed seeing them. Have a good wknd! Thanks and thanks for coming by. Hoping that you have a good weekend as well. Raja and Zoe are adorable just relaxing among the phlox. I can’t believe how gorgeous all your daylilies are. Due to the hot dry summer I didn’t take care of mine as well as I should have. I was busy concentrating on some of my other perennials. Thank you for sharing all your beauty with us. Thanks. This summer has been really hard for a lot of people. Hope your garden hasn’t suffered too much. 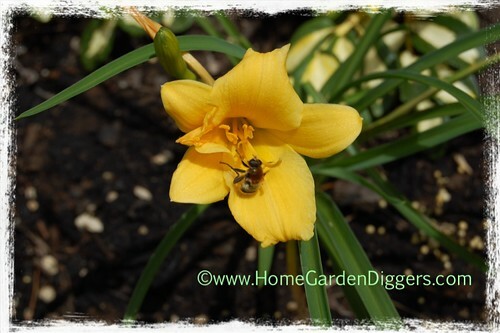 Hi Yael: You have an outstanding daylily collection–gorgeous. 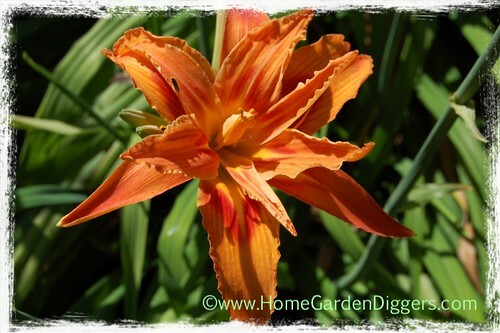 I love the double orange one–I don’t think I’ve ever seen a double daylily before, so that is really neat. 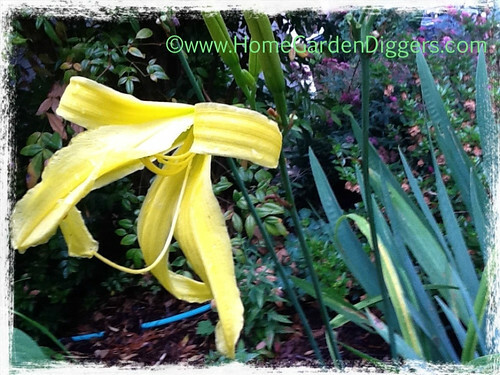 I also like the unusual yellow spider daylily–another new one to me. Take care, thank you for visiting my blog today, and have a fantastic weekend! I actually have two doubles. The orange double daylily was here when I moved in. The clump is huge an I will need to scale it back at the end of the year. The red one is a newbie, and I really like it. I now have another spider daylily. I ordered Alien Landing for way too much and it is already in a pot where it will stay till next year. That one is a dark mauve with yellow spines and throat. I Needed it. I think this weekend the rest of my clematises and Daylilies in pots will get planted. Hoping you have a good weekend. Love you daylilies and if you come visit you will see I love them too. They are truly workhorses in the garden. I just got six new ones. I am trying to keep track of the names and my record keeping is improving. I love the one you have called Blue eyed butterfly, I am on the look out to add that to my collection. 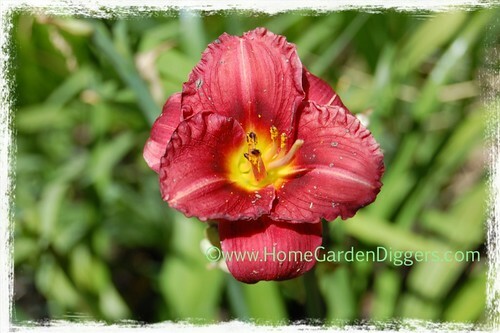 You are so right about Daylilies being workhorses in the garden…and what a pretty workhorse. I hope you find Blue Eyed Butterfly. I saw it online and tracked down a nursery and ordered it about three years ago. It was not horribly expensive either. Hoping you have a nice weekend. Gorgeous collection of lilies, each prettier than the other, I just can’t decide which is the best. Thank you and thanks for coming by. Hoping that you have a nice week. 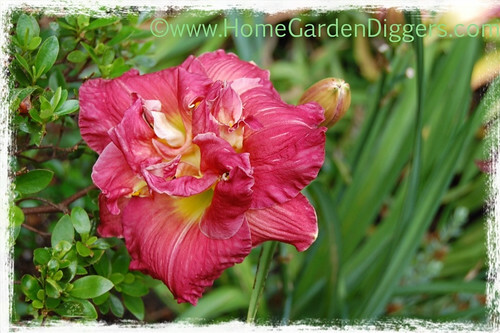 You really have a gorgeous collection of Daylilies. I have 4 varieties, but would like more. Tomorrow I am going to visit a neighbor who have hundreds. She grew up on a flower farm. Can’t wait! Thanks for sharing your beauties with Share Your Cup.